The Dakar 2014 was highly dramatic until the last minute. The clash of titans between Iveco and Kamaz will have been a close one until the very end. But the truth triumphed in the end. You can fall at accident but you will never win at random. At the finish line the overall leader Andrey Karginov is 9’35” behind the Dutchman’s Iveco. Andrey Karginov is for about 3 minutes behind Gerard de Rooy in the general classification. This is the second result. Then we note the information on the official website: a lot of competitors were hindered by an accident during the special. Details appear later. 90 km into today’s special, China’s Zhou Yong made a mistake, sowing chaos as his car crashed and blocked the road before eventually being removed. Gerard De Rooy with his truck №501 passed there touching the damaged car, but he didn’t stop to help the crew. Gerard de Rooy used his starting order to slip ahead. Then the crews of Karginov and Nikolaev arrived and try to put the car on wheels by hand, but it was without success. They managed to set the car back upright just with the help of the truck of Andrey Karginov. The way was unblocked and a traffic jam of race vehicles could continue the way. The need to help the crew 319 is undisputed, and race officials had to deduct some minutes from the time of the KAMAZ №306. The results of the stage were corrected. Andrey Karginov won his first Dakar by 3′11″ over Gerard de Rooy. Behind them, the other KAMAZes hogged places 3 to 5, with defending champion Eduard Nikolaev, Dmitry Sotnikov and Anton Shibalov. Even though 22 minutes that the organizers presented to the main rival of the KAMAZ-master Team Andrey Karginov became the winner of the Dakar 2014. 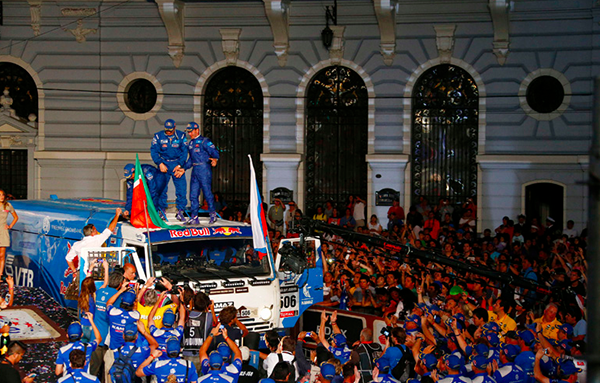 It is deserved outcome of the 36th edition and the twelfth team victory on the rally Dakar.